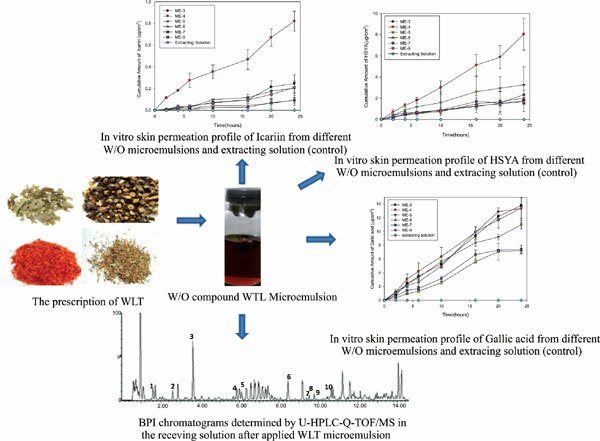 Objective: The aim of this study was to develop a novel W/O microemulsion for a natural extract of Wen-Luo-Tong (WLT) containing mainly icariin, hydroxysafflor yellow A (HSYA) and gallic acid to be applied to skin as a potential treatment for peripheral neuropathy. Methods: The oil phase was selected on the basis of affinity with the surfactant and co-surfactant. Pseudo-ternary diagrams were constructed to optimize microemulsions and finally stability studies were performed on the selected formulations. Droplet sizes were analyzed by using a zetasizer and were found to be within the desired range. Selected microemulsions with acceptable viscosities, containing 5%, 8% and 10% of water extract solution, were used for in vitro skin penetration studies using Franz diffusion cells and excised rat skin. New LC-MS/MS and UPLC-Q-TOF/MS methods were employed for quantitative and qualitative analysis. Results: The optimized formulation (ME-4) consisting of 10% (w/w) water extract solution, 60% isopropyl myristate, 30%(w/w) Smix: Propylene glycol (5:2) significantly increased the cumulative permeated amounts of HSYA, icariin and gallic acid compared with the water extract solution controls. Conclusion: This novel formulation also increased the number of components penetrating rat skin. Ten components were detected in the Franz cell receptor solution using a UPLC-Q-TOF/MS system after the application of formulation ME-4 for 24h on the skin in vitro. However, only one component was detected after applying the control. Therefore, the microemulsion ME-4 was selected for future in vivo pharmacodynamic studies. Microemulsion, transdermal delivery, LC-MS/MS, UPLC-Q-TOF/MS, gallic acid, icariin, hydroxysafflor yellow A.